November 13, 2012 • Page 12 1410 Agriculture 4WD QUALITY OFF-ROAD MINI TRUCKS FOR SALE 40MPG automotive engine, HEATER, full FUNCTION Cabs & more, several models to choose from. www.ulmerf a r m s e r v i c e . c o m (605)387-5660 or (605)661-5050, Menno, SD. Sucker Rod & Pipe. All sizes for fencing and manufacturing. Menno, SD. (605)387-5660 (605)661-5050. Sweet Pro lick tubs, no molasses, high fat, distillers grain, horse tubs, Redmond Natural Mineral Salt, cut mineral cost by 50%, affordable. Kay Dee Mineral. www.sweetpro.com. (402)844-3046. 1415 AC - Heating Don?t pay high heating bills. Eliminate them with an OUTDOOR WOOD FURNACE from Central Boiler. Bearnes Enterprises 402-256-3048 shop online at www.missourivalleyshopper.com 1435 Carpentry 1455 A Full-time Carpenter Available. No job too small! Free estimates. Lots of experience. Call Bob Edwards at (605)665-8651. For All of Your Carpentry Needs: Custom Built Windows, Siding, Garages, Additions, Patios and More. Call Andersh Carpentry at (605)661-1190. Gene?s Carpenter Service. Additions, 3-season rooms, basement/remodeling, doors/windows, garages, kitchen-baths, siding, total carpentry work. (605)660-4663. 1450 Cleaning Will do housecleaning or office cleaning. (402)380-4686. Call Classi?eds 665-5884 Read & Recycle! 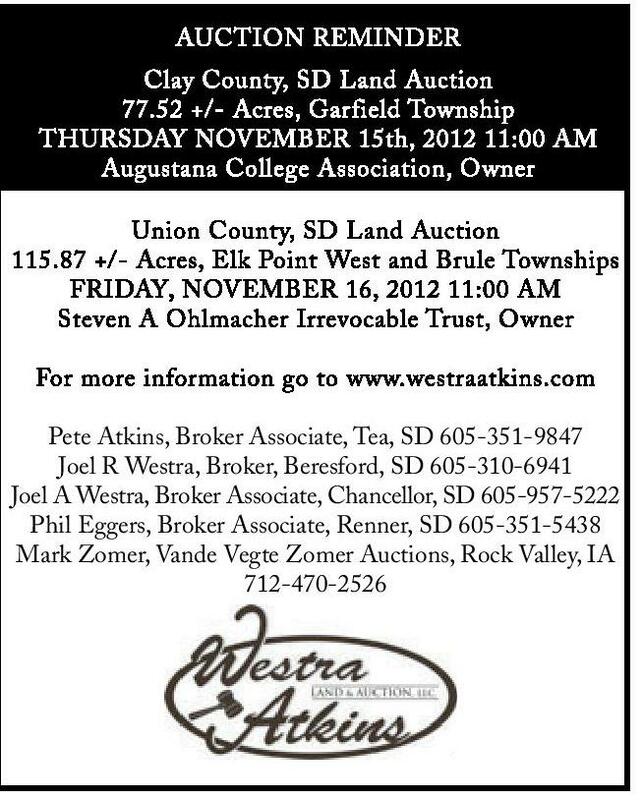 AUCTION REMINDER Clay County, SD Land Auction 77.52 +/- Acres, Garfield Township THURSDAY NOVEMBER 15th, 2012 11:00 AM Augustana College Association, Owner Union County, SD Land Auction 115.87 +/- Acres, Elk Point West and Brule Townships FRIDAY, NOVEMBER 16, 2012 11:00 AM Steven A Ohlmacher Irrevocable Trust, Owner Computer - 1490 Internet FREE WIRELESS Income Opportunity Three websites with the details: www.TheSmartPhoneClub.com; w w w. z e r o - c e l l - b i l l . b i z ; www.blog4pay.com or Call: 1-800-211-3510 Ext 1001 (mcn) 1460 Contractors VERMILLION CONSTRUCTION CO. Poured Foundations, Flat Work; 40 Years Experience; Commercial & Residential; Free Estimates. (605)658-2345. 1475 1490 Lawn Landscaping WILL REMOVE TREE Stumps. Schumacher Tree Stump Removal, Insured. Dennis Schumacher, Call (402)388-4487. Klein?s Tree Service 1601 Eastside Dr. Tree removal, tree trimming Stump Grinding (605)665-0119/ (605)660-0028. www.naturescapingdesigns.com Toben Tree Service: Trimming, tree stump removal, landscaping, pasture clearing, Cedar tree removal. Firewood/camping packages available. Fully Insured. Commercial/Residential (605)660-4640. Moving - Storage A-1 Self-Storage 10x15, 10x10 units available. 24 hour easy access, behind Classic Car Wash (605)665-1828. Huber Storage units. Concrete driveways, security lighting, 24 hour access. Special: 12th month free! (605)665-2286. 1505 Painting Interior painting. Free estimates. (605)661-0972. 1530 Roofing - Siding Johnson Seamless Gutter. Free Estimates, work guaranteed, insured. (605)661-8097. Corby Johnson Roofing & Construction. Free Estimates, work guaranteed, insured. Also, specializing in Seamless Gutters (605)661-8097 JW Roofing: Shingling complete tear-off, redecking if necessary and insured. Free estimates. References. Work guaranteed. Call (605)665-1167, or (605)760-1782. 1555 APR Labrador puppies, yellow, 2 females, 5 males, Born Sept. 29. Will have their 6 week vaccines and dewormed. $300. (605)661-1205. Miniature Schnauzer puppies for sale. We have to find new homes, Males and females, all shots and wormed. Call (402)847-3381, leave message. We will get back to you. Read & Recycle! Let Our Design Team Inspire You... join us for... Design slumberland’s Large Consignment Solutions AUCTION We have a variety of consignors offering everything from household goods to vintage furniture to modern décor. You won’t want to miss the opportunity to take home wonderful gently used items just in time for the Holidays. This sale will include many end tables, dining room sets, bedroom sets, Holiday decorations; desks; chairs; several consignors are reducing their inventory of household items; wicker porch swing; wicker couch chairs & tables; approx. 20 tables of home decorating items; knick knacks; glass ware; etc. ; several large boxes of new bed linens; plus several boxes of VINTAGE LINENS AND BOLTS OF VINTAGE CLOTH Many unique items offered were used by Lewis and Clark Realty, Inc. agents in real estate staging such as a beautiful glass table; flower stands; pictures; some wall décor; dark wood computer desk with open shelving; black wood divider; decorative wood & wire birdcage; Japanese divider screen; end-of-bed chest; octagon fish tank/stand; square oak table; several TV’s; Oak table w/self storing leaves; lamps; Square Oak table; several office desks & chairs; many more very nice items; doll house; round mirror; Brass queen size head board; antique oak side table; small church pew; Vintage china hutch Vintage tools: #45 & #48 Stanley planes complete set; planes; drills and other hand tools; Propane furnace; 2 rings at times Terms: Cash or bankable check • Lunch on grounds East River Auctioneers Thursday, November 15th • 6:30pm – 90 minute demo – FREE! FREE! slumberland furniture that lives the way you do 920 Broadway, Yankton • 665-3719 First 20 participants to receive special discounts & prizes! Sign Up Today! PLUS grand prize drawing! Enjoy Treats & Coffee! 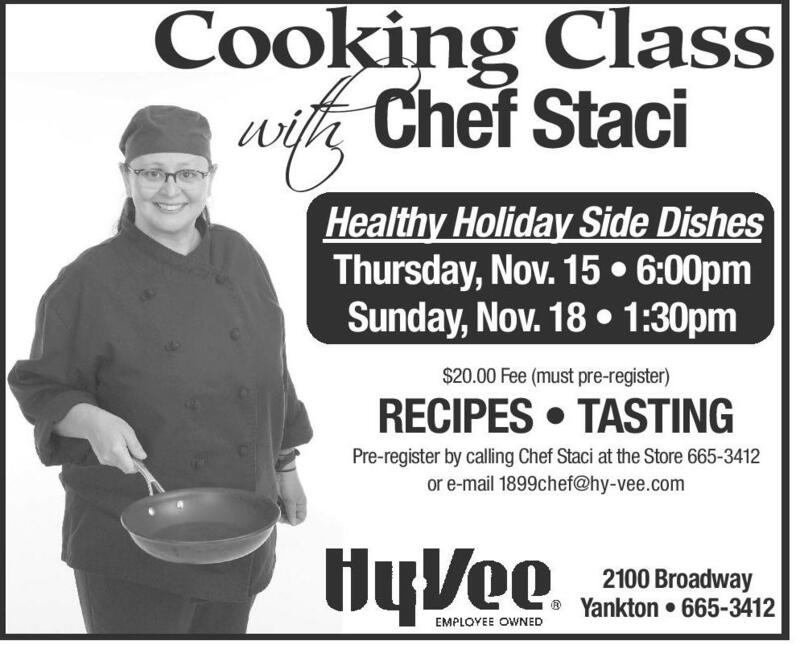 Cooking Class w ih Chef Staci t Healthy Holiday Side Dishes Thursday, Nov. 15 • 6:00pm Sunday, Nov. 18 • 1:30pm $20.00 Fee (must pre-register) RECIPES • TASTING Pre-register by calling Chef Staci at the Store 665-3412 or e-mail 1899chef@hy-vee.com D.W. Duhachek – Auctioneer 605-660-7777 Leo Harts – Auctioneer 605-660-2460 Check for more details on our website www.eastriverauctions.com We Sell: Land • Home • Household • Farm • Machinery Wanted: A new home for Fen, he loves long walks and is very caring. He is a 1-year old Boxer Shepherd Mix, neutered and housetrained. For more information, please visit www.heartlandhumanesociety.net or call (605)664-4244. Ad sponsored by Sally & Terry. Lewis & Clark Realty, Inc. Dogs - Puppies AKC German Shorthairs, excellent bloodlines and traits, intelligent, mild-mannered, excellent hunters. Tails, dew claws, shots and vet checked. Born 09/20/12, ready 11/8/12. (402)388-4901. For Sale: APRI Registered male Toy Parti Poodle, shots, dewormed, ready Nov. 12. (402)337-0086, leave message. Pete Atkins, Broker Associate, Tea, SD 605-351-9847 Joel R Westra, Broker, Beresford, SD 605-310-6941 Joel A Westra, Broker Associate, Chancellor, SD 605-957-5222 Phil Eggers, Broker Associate, Renner, SD 605-351-5438 Mark Zomer, Vande Vegte Zomer Auctions, Rock Valley, IA 712-470-2526 Saturday November 17th 10:00 a.m. Dogs - Puppies . (605)661-1205 For more information go to www.westraatkins.com 1102 West 21st St., Yankton, SD 1555 Seamless Rain Gutters, we install 6” for the price others charge for 5”. Residential & commercial. Gutter cleaning available. (605)215-7248 NatureScaping Designs LLC. Landscape Design & Installation. Now booking 2013 season. Other Services 1500 House cleaning - Vermillion area, general housekeeping for home/office. Email for rates and references. tidyvermillion@gmail.com Lawn - 1530 Roofing - Siding Landscaping •Affordable Gutters 2100 Broadway Yankton • 665-3412 1560 Cats - Kittens Free tame male kitten to a good home. Orange tabby, 3-months old, dewormed, litter trained, very friendly. Tyndall, Jeff (605)760-2204. Giveaway, Cat, less than a year old. Born April 18th. (402)358-0477 in Yankton. Giveaway: Country cats, four older kittens, 2-3 adult cats, not used to dogs. Leave a message (402)229-3282. 1565 Other Pets ADOPTIVE HOMES NEEDED for several kittens, dogs & puppies. See Heartland Humane Society at www.heartlandhumanesociety.net or call (605)664-4244. Rhode Island Red ready to lay pullets. Also dressed rabbits. Call Uecker’s Poultry, Louis Uecker, (402)379-1680. 1605 Apartments For Rent 1 & 2 Bedroom, Orchard Square, 418 W. 15th. Can be rented with subsidized rent or $440 or $490 including utilities. (605)665-6135 or Skogen Company (605)263-3941. 3-Bedroom Apartments. River Court Apartments, Vermillion. Rent based on income. Must qualify by family size and income. One unit is Handicapped Accessible with roll in shower. Equal Housing Opportunity. 605-202-0008 or Skogen Company 605-263-3941. Boardwalk Apartments: Available soon: 2-Bedroom and 1-Bedroom with garages, furnished/unfurnished, month-to-month or lease. Access to hot tub and workout center. No smoking/pets. ( 6 0 5 ) 6 6 5 - 9 9 3 9 (605)661-0517. Read & Recycle! ST. JUDE NOVENA May the sacred heart of Jesus be adored, glorified, loved and preserved throughout the world, now and forever. Sacred Heart of Jesus, pray for us; St. Jude, worker of miracles, pray for us; St. Jude, helper of hopeless pray for us. Say this prayer 9 times a day, your prayers will be answered by the 8th day. It has never been known to fail. Publication must be promised. Thank you Jesus & St. Jude. G.K.